With our recent cold weather snap, it is great to find something fun to do indoors with my neices! Last weekend, I had the chance to bring out the new Moon Dough Zoo for them to play with and I never would have imagined how much fun it would be for both them and me! I’d never seen Moon Dough before, so I wasn’t sure what to expect! It turns out that Moon Dough is very soft (when you pull it apart, it reminds me of the inside of a marshmallow candy), easy to mold and incredibly easy to clean up (you just take the ball of Moon Dough and touch any little bits on the table and they will attach themselves automatically). Moon Dough is also revolutionary because it never dries up. The Moon Dough Zoo is really cool because it has a number of different, easy-to-use parts with it. 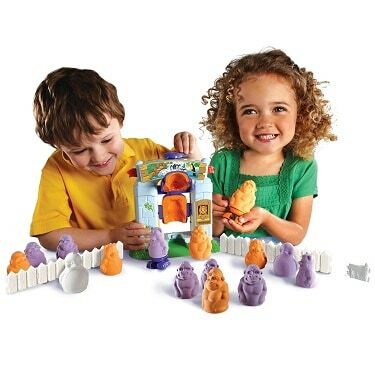 It includes: a Magic Moulding Zoo (to press the animal molds), 2 Winder Walkers (to make the animals walk), 3 animal moulds, a fence mould and 3 colors of Moon Dough. When I showed the girls the Moon Dough Zoo, I was surprised to find that my older niece had actually played with a Moon Dough set at her friend’s house before and she knew how to use the animal molds and the molding zoo to make the animals. She decided to take charge and show us how everything worked! My younger niece really loved Winder Walkers (even before they were combined with a Moon Dough animal, she wanted to wind them up and make them walk all over the table). I think the funniest thing was when my younger niece would touch one of our completed fence moulds and squish it (as it is really soft) and then say, “Oh no – I broke it!”. I’d then tell her it was okay because we could make another one and show her and she would say, “Okay”….then two minutes later I would hear “Oh no – I broke it!” and we’d start the pattern all over again! I was amazed at how much fun I had playing with my nieces and the Moon Dough Zoo and how enthralled they were by Moon Dough – we played for about an hour and a half and they have been playing with almost daily ever since! For more information about Moon Dough, visit the Moon Dough website. *I did not receive any financial compensation for this review, though I did review a sample of the product for evaluation purposes. The opinions based only on my experiences wtih the product. We have this set and the kids love it. They love the wind up feet! My kids love Moon Dough too but I find that it breaks up easily and it ends up everywhere, on the floor, table, chairs. I’m constantly vacuuming after they play. I have to vacuum all the time too with this stuff. I don’t know whose idea it was to put carpet in a dining room, but it does not go well with moon dough! My daughter loves it though! I’d like it better if we had a different floor. It was so messy inside but SO much fun that we came up with a Moon Dough solution that works for us….I spread an inexpensive plastic or vinyl (works best) tablecloth outside in the driveway and let the kids have a blast then when we are done just fold it in half and slide the sand back into the container. They love it plus get some fresh air too!